Choosing the perfect favor for your guests just might be one of the hardest decisions you’ll make when it comes to planning your wedding; after all, it’s not easy choosing a gift that all your friends and family will love and won’t cost you a fortune in the process. If you’re having a fall wedding, however, and are DIY-inclined, it’s your lucky day because we’ve rounded up 10 easy DIY fall favors for you that won’t break the bank. 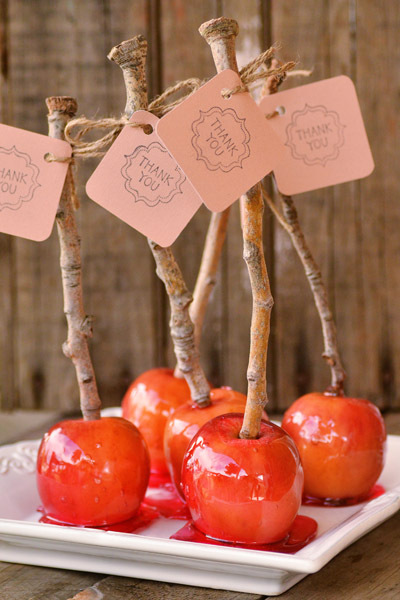 You can’t have a list of fall wedding favors without including candy apples. You can choose any recipe you like, but we think these candy apples would make particularly charming gifts for your guests, don’t you think? 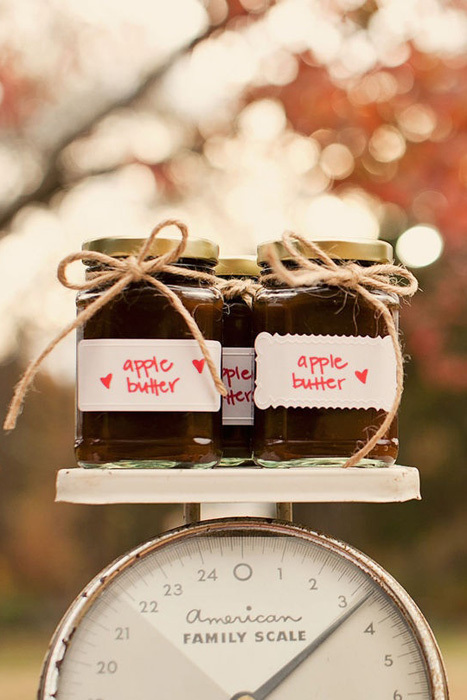 Apple, pear, pumpkin…whatever you choose, fruit butters make quick, easy and delicious favors your guests will absolutely love. 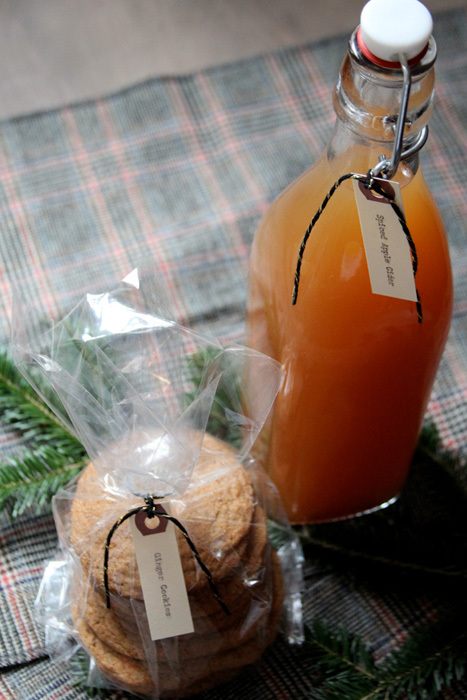 Rounding out the apple-centric favors is a bottle of spiced apple cider—perfect for an apple orchard wedding. Fall is the season for warm, spicy and boozy beverages, mulled wine being one of our absolute favorites. 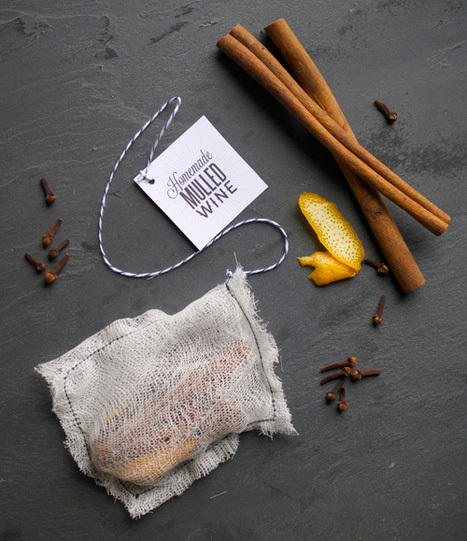 You might not have the funds to give every guest a bottle of mulled wine, but you can give them the spices to make it themselves—just don’t forget to include instructions! 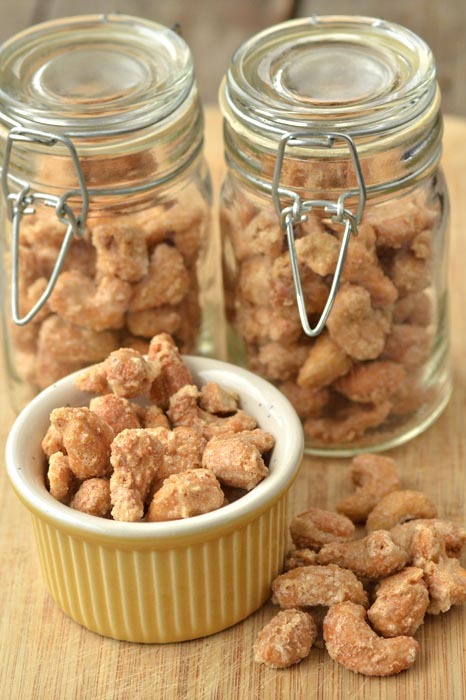 Who doesn’t love candied nuts? Gift them in mason jars wrapped with yarn for that perfectly sweet and rustic look. When it comes to tasty food favors for fall, we can’t forget about the mighty pumpkin, now can we? 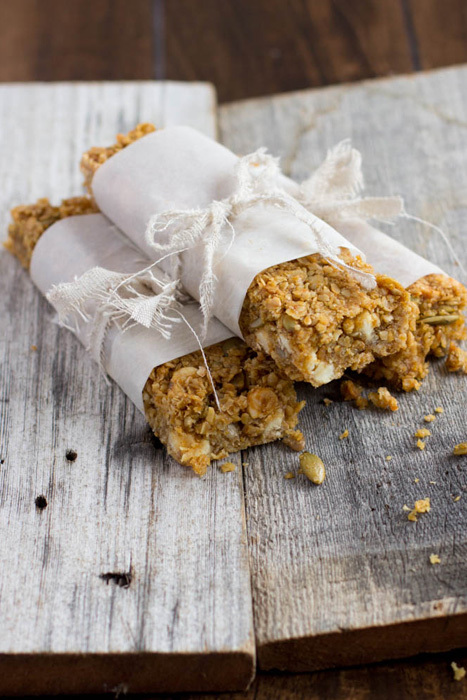 These pumpkin spice granola bars would make a great late night wedding snack. 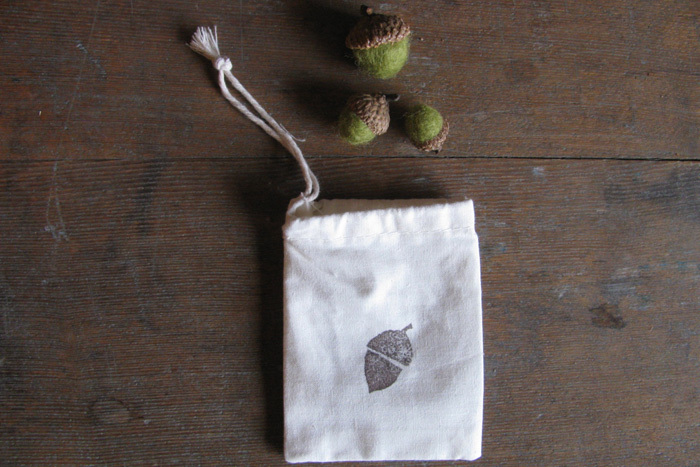 If food favors don’t float your boat, why not make some cute felted acorns for your guests instead? 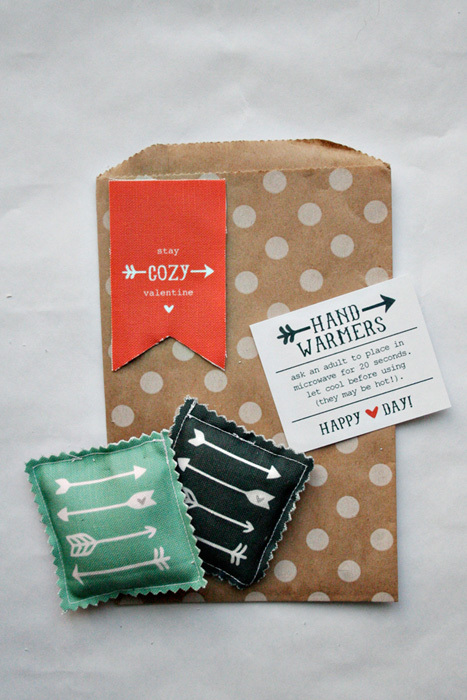 Throw a few in stamped favor bag and you’ve got yourself a sweet little gift. 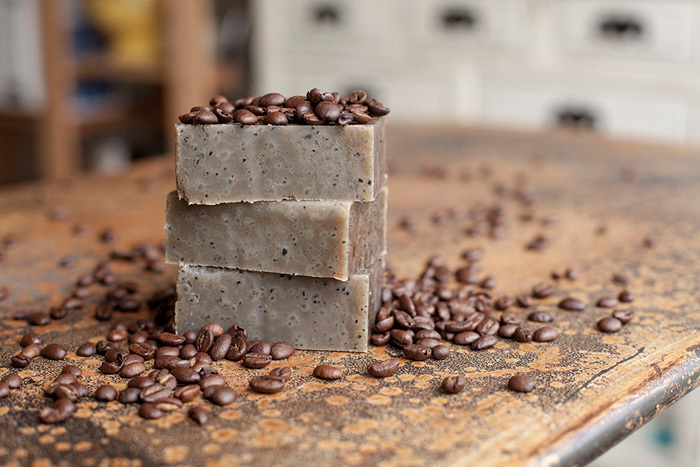 Soap isn’t a particularly fall-specific favor, but this cafe soap from Offbeat and Inspired would be perfect for the autumn season. Wrap each bar in unbleached parchment paper and tie it up with baker’s twine for a simple, but pretty presentation. If you’re opting to brave the cold and have an outdoor fall ceremony, these little hand warmers are a no-brainer favor—they’re quick and easy, and your guests will thank you. Is there anything better on cool autumn eve than a roaring fire? 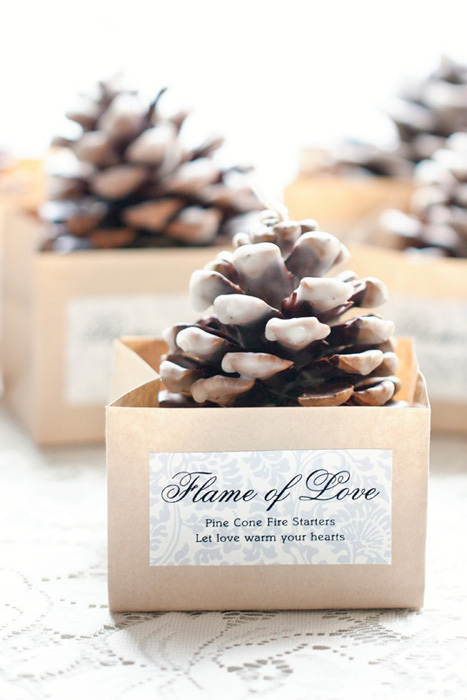 Pinecone fire starters are dead simple to make and you can add essential oils to them so even if your friends don’t have fireplaces, they’ll have a pretty and delicious smelling decoration.